Current Status of "Peggy Martin Rose" - Spring, 2008. 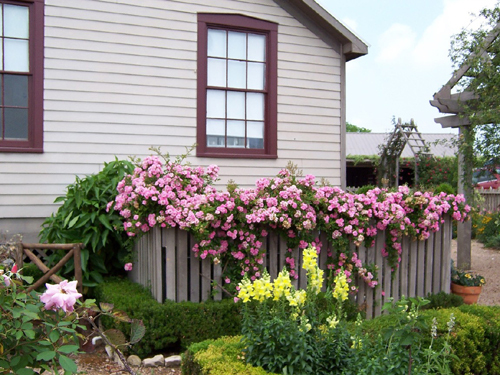 The "Peggy Martin Rose" was one of only two plants surviving 20 feet of salt water over the garden of Mrs. Peggy Martin, Plaquemines Parish, Louisiana, after the destruction of Hurricane Katrina in late August, 2005 (please see "Early history of the "Peggy Martin Rose" below). Since then, it has been introduced into commerce in the United States and has become a symbol among gardeners and rose lovers of a tenacious plant associated with a spirit of renewal and regrowth in the aftermath of a devastating blow of Nature against those living and gardening in the Gulf Coast area. These growers are generously donating $1 per plant to the Greater Houston Community Foundation, with the purpose of assisting in the task of garden restoration projects in New Orleans, Beaumont and other Gulf Coast locations. 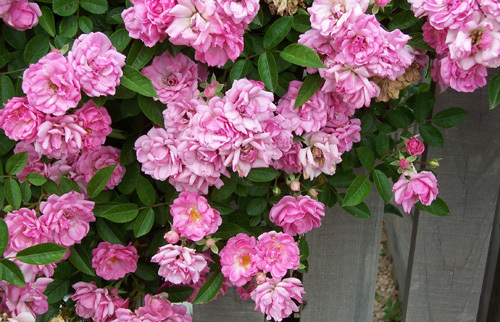 With its good looks and healthy vigor, the "Peggy Martin Rose" is well on its way to becoming a classic garden mainstay for those wanting a mannerly climber that is thornless, with abundant pink clusters of small flowers. After it has become established, it reblooms in the fall when the hot temperatures abate. The Early History of the "Peggy Martin Rose"
Peggy Martin has been a mainstay in the New Orleans Old Garden Rose Society for many years. She and her husband, MJ, lived in Plaquemines Parish a few miles across the Mississippi River from the city of New Orleans. My wife, Diane, and I were her guests several years ago when I accepted a speaking engagement for the NOOGRS. Peggy graciously cared for us during our visit and entertained us in her home with a memorable Louisiana style seafood boil that had been harvested by her husband just hours before. Peggy's garden included a wonderful collection of old roses assembled with love and care over the years. There were many wonderful specimens that appealed to me but one rambler in particular caught my eye. I am always interested in thornless roses and Peggy was particularly enthusiastic about a large, healthy specimen she had collected in 1989 in New Orleans. According to Peggy "I was given cuttings of the thornless climber in 1989 by Ellen Dupriest who had gotten her rose cuttings from her mother-in-law, Faye Dupriest. Faye had gotten her cuttings from a relative's garden in New Orleans. When I first saw this rose it was in full bloom and smothered the 8ft wooden fence in Ellen's back yard. It took my breath away! I had never seen a rose so lushly beautiful with thornless bright green foliage that was disease free. All along the canes there were clusters of roses that resembled perfect nosegays of blooms". I departed from New Orleans in the late summer of 2003 with several cuttings of Peggy's thornless climber. I was pleased that the cuttings rooted quickly and immediately set one on the fence that encloses the A/C equipment at Fragilee, our weekend home in Washington County, TX. I was a little dubious of the site I had selected because the soil was less than ideal. My concern soon disappeared as I saw the cutting quickly mature into a vigorous specimen that spans most of the 12-15 linear feet of 4' tall picket fencing. I didn't allow myself to get overly excited about the plant because I assumed that it would be a "once bloomer" with a fairly short flowering season in the spring. On a subsequent visit with Peggy she indicated that my plant would rebloom in the fall after it had been established for a couple of years. I must admit that I had some doubt about the rebloom in our hot and sometimes very dry Texas climate. Last year Peggy's rose rewarded us with a nice bloom from September through November. Even with being covered by ice for two days during mid-December '05 we have had some scattered bloom all winter. We fretted about many of our New Orleans friends during the 'Katrina' storm. Getting information was not easy with so much of the communications system inoperative. We were uneasy about traveling to Birmingham for an annual meeting with the gardens staff for Southern Living magazine. We spent the night of September 7, at our home in Mangham, La. Mangham is in the northeastern part of the state and 'Katrina' had only brushed by as it veered to the east through Mississippi. We were relieved that our cotton and soybean crops received only minor damage and the old pecan trees in our yard suffered little more than loss of most of this year's crop. Upon arrival in Birmingham we checked into the Marriott Courtyard located near the Southern Living headquarters. Early the next morning we went to breakfast and were seated adjacent to two couples who sounded like they had New Orleans accents. After introducing ourselves we learned that they were from Plaquemines Parish and had lost their homes. Birmingham was the first place they were able to find shelter. I asked them if they knew Peggy Martin and her family and they said they knew them well and were we familiar with the tragedy of their losses? It seems that Peggy lost both her elderly parents in the flood that inundated nearly all of Plaquemines Parish. We were, of course, deeply saddened that Peggy had lost her parents, her home, and commercial fishing boat that her husband used to supplement their income. It took a couple of months for me to reestablish communication with Peggy. She and her family have moved to Gonzales, LA which is close to Baton Rouge on Interstate 10. I asked Peggy about her roses and home and she indicated the house and garden were under about 20' of salt water for two weeks following the hurricane. When she was finally able to return to visit their property she was heartened to see the lush growth of her thornless climber, a testament to its toughness and status as a true survivor. This rose and one crinum were all that remained of the once beautiful garden. I had already been convinced that this rose deserved to be widely available and enjoyed by gardeners in other locations. Its disease resistance, thornless stems and colorful displays of bright pink flowers along with a graceful vining form make it a logical choice for creating beautiful garden pictures. My specimen is literally covered with clusters of dark pink flowers each spring from mid-March through May. It starts blooming again in late summer and repeats until a hard frost slows it down for the winter. In mid-January I was pleased to receive a notification that my friend Nancy Godshall, a member of the Garden Club of Houston and currently Zone IX Director for the Garden Club of America had given a donation in my name to a recently established Zone IX Horticulture Restoration Fund. The fund was established for the purpose of restoring parks, gardens and green space in New Orleans, LA, Laurel, MS and Beaumont TX, following Hurricanes Katrina and Rita. I was pleased to learn that Nancy Thomas, also from Houston and a former GCA President was closely involved in selecting projects for the restoration fund. An idea came to me early on "in the middle of the night" about growing the "Peggy Martin" rose as a fund raiser for Zone IX Horticulture Restoration Fund. First, I checked with Peggy to see if she would be in agreement then I went to Mike Shoup, owner of the Antique Rose Emporium. Mike was enthusiastic - the first small crop of cuttings we provided quickly increased into a good supply. Jason and Shelley Powell, owners of Petals from the Past Nursery in Jemison, AL were impressed with the rose while visiting here in late October, '05 and took quite a few cuttings at that time. Jason received his Master's Degree from Texas A & M and was an early recipient of my scholarship sponsored by Texas Garden Clubs, Inc.
Mark Chamblee, owner of Chamblee Rose Nursery in Tyler, TX is enthusiastic about marketing the rose, as is Aubrey King, owner of King's Nursery in Tenaha, TX and Sue Riley of Naconiche Nursery near Nacogdoches, Tx. Ms. Heidi Sheesley of Treesearch Farms in Houston serves as a wholesale source for larger orders. Addresses and phone numbers for these sources are included below. A large number of ready-to-sell roses became available in 2007 and are readily available in the spring of 2008. Each of these growers has pledged a $1.00 per plant donation to the Garden Restoration Fund for each plant. Reduced or wholesale prices may be available for Garden Club Plant Sales, Master Gardener Events, etc.. This would allow more opportunity for contributions. This has become a fun and worthwhile project! A great rose and a great cause. This is a hard combination to beat! I am fully convinced that the resilience and fortitude of our friends and neighbors in New Orleans, Beaumont and Mississippi is matched by the beauty and toughness of the "Peggy Martin" rose. This rose is a beautiful symbol of survival on the Gulf Coast.